Sydney tourist maps of places, including Central Sydney CBD map, Darling Harbour map, Manly, Parramatta, Sydney Harbour, The Rocks and Train Stations. Places to shop are marked in yellow, attractions, museums and art galleries by name. On the Accommodation Maps you can find hotels with nearby attractions and other places of interest Sydney Hotels Map. See the Melbourne Attractions and Hotels Map Melbourne Hotels Map. 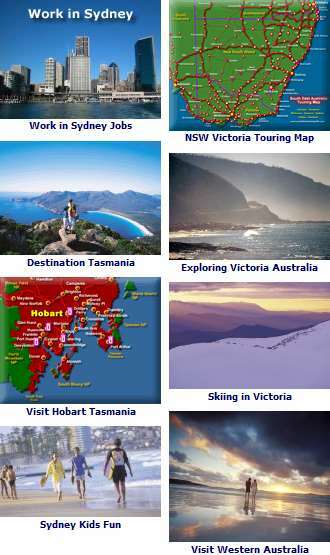 For tourist maps of Australia, including our states and territories, see Australia Maps and of course, the Australia Map. Map of Tasmania: Tasmania Map. How to get to the Sydney Opera House: Sydney Tourist Map - Sydney Opera House Map. 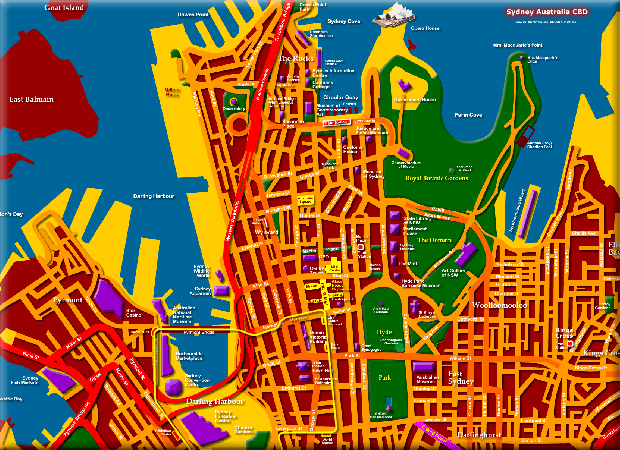 Sydney Map - Interactive Tourist Map of Inner Sydney Australia. Sydney CBD Map - The city centre has much to offer in attractions, museums, culture and entertainment! 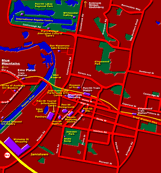 - Central Sydney CBD map. South Sydney CBD Map - Sydney Convention Centre, Exhibition Centre, Dixon Street Chinatown, Wentworth Park Greyhound Track, Fish Markets, The Powerhouse Museum, Central and Town Hall train stations. Also the route of the Light Rail to Darling Harbour and favourite Sydney shopping spots. See more about the inner Sydney city Sydney Central. Showing major roads and City surrounds Map of Greater Sydney. Blackheath, Katoomba, Richmond, Windsor, Gosford, Wollongong, Hornsby, Bondi Beach, Manly Beach, Palm Beach, Chatswood, Sydney Airport, Parramatta and Cronulla. Sydney Tourist Map Darling Harbour Map - For all ages! The National Maritime Museum, Sydney Aquarium, Sydney Wildlife Centre, Shopping and the Exhibition Centre. Find Darling Harbour Hotels Darling Harbour Hotels. Darling Harbour Map - for Great Food, Entertainment, Attractions for the whole family and Shopping. See more on Darling Harbour Sydney. Other side of Town, Kings Cross: Kings Cross Map. Manly is seven miles from Sydney by ferry, See more about Manly Sydney. Attractions here include OceanWorld and the beautiful beaches, you can also find some great restaurants. 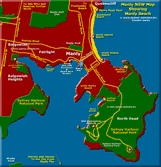 Sydney Tourist Map Manly Map - Sydney’s Seaside Resort. Parramatta Tourist Map showing parks, attractions and places to visit Parramatta Map Sydney. Parramatta NSW was established in the early colony for its rich farmlands. The soil near the original Sydney Cove penal settlement proved too sandy for sustained agriculture. Only 20kms west of the city centre, today Parramatta is a thriving business centre with rich historical roots. See more on Parramatta NSW. Penrith Sydney Tourist Map Penrith Map - Experience Penrith Valley. Penrith NSW is at the foot of the Blue Mountains, by the Nepean River. See more on Penrith NSW. Sydney Trains - Sydney Central City Circle Train Stations Map. Sydney Harbour Map - with Ferry Cruises. Featuring Ferry Tours on Sydney Harbour. The Rocks Map - Restored Historical District - Australian Convict History. The Rocks is Australia’s finest restored colonial district. See more on The Rocks NSW Australia. There are plenty of beautiful beaches in Sydney. See more on Sydney Beaches. Sydney CBD Map 1855. West - Central City Historical Places in 1855. Sydney CBD Map 1855. East - Central City Historical Places in 1855. See the Central Sydney CBD Map in 1855. See how much has the Sydney CDB map has changed? Compare to the present day Sydney CBD Map. See more Australia Maps Map of Australia - Also maps of Australian Capital Cities and States. Finding Australia Jobs, Employment Work in Australia. More about Australia see Australia Tourist Guide.